Despite a common fear/myth that prices will go higher, in fact Adobe continues the long trend of dropping subscription pricing as worldwide adoption accelerates. With CC 2014, they have taken two pricing promotions that were offered (and very popular) on Black Friday of last year and actually made them into permanent deals. The first is the education special of $19.99 for the first year for students, teachers, and staff at almost any academic level. This plan includes the entire CC 2014 release, which is virtually every major creative tool Adobe makes from Photoshop to InDesign to After Effects. Now, all new education customers will be able to benefit from this lower entry rate. And the second offer is the CC Photography Plan, which nobody could believe was real on Black Friday – but this deal is also now available to everyone all the time, with no prior product ownership necessary… It gives the latest versions of both the full desktop Photoshop CC and Lightroom 5, plus mobile tools and all ongoing upgrades for the regular price of $9.99/month. Meanwhile, pricing for all other CC 2014 plans remains stable to what it was with CC 2013. For Enterprise/volume customers, Adobe added file storage and collaboration to Creative Cloud, along with expanded options for deployment (named user vs. anonymous) and a new dashboard for managing users and entitlements. For Adobe’s core flagship creative applications like Illustrator and Premiere Pro, much has evolved. The tools run faster, take better native advantage of modern 64-bit processors and GPUs, with cleaner and smoother user interfaces, bugs fixed, and many new capabilities added. Overall, there are hundreds of new features in CC 2014 compared to CC 2013 – and close to 1,000 updates since CS6 came out in 2012. But on top of all those, Adobe has also launched new apps and services for all Creative Cloud members, some of which are available even to free users. Among these new apps and services include are the long-anticipated Lightroom Mobile (for iPad and iPhone) and Lightroom Web for storing, bringing and working on your photos anywhere – these both work in conjunction with Lightroom 5 for desktop. Other new mobile apps released – which are completely free for everyone everywhere – are Photoshop Mix for easy-to-use advanced imaging in the go, Adobe Sketch for social/mobile drawing, Adobe Line for precise drawing and drafting, and Adobe Spark to turn any story into a stunning ani­mated video in minutes. The company also introduced integrated Ink and Slide hardware (additional cost) that extend desktop workflows to unlock professional-grade creativity on mobile. There’s also the the all-new Creative Cloud Market – a curated collection of high-quality content that subscribers can access for free. It’s a broad selection of over 20,000 useful assets and growing: images, artwork, vector graphics, icons, patterns, and more – where you can download up to 500 unique royalty-free assets each and every month for permanent royalty-free use in your own projects. 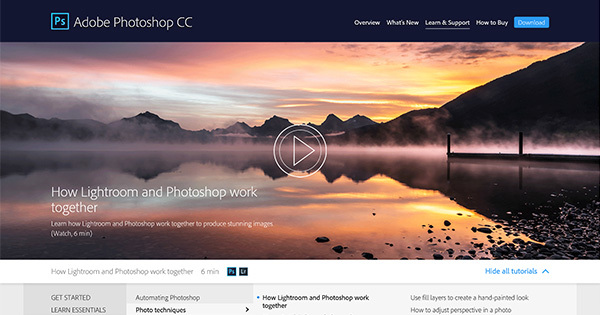 With CC 2014, Adobe also rolled out hundreds and hundreds of free online tutorials filled with media-rich learning content for all major applications. These substantial, high-quality lessons will train you in getting started, product essentials, and key techniques for the tools – and are part of the new Creative Cloud Learn resource, which is available free to all readers. Related: Don’t miss our collection of dozens of free Adobe books you can download now. In sum, Adobe raised the bar on what’s available to you in Creative Cloud while keeping pricing flat to lower. Existing CC customers get all of the above automatically at no additional cost. For others, the company also reset the free tryout periods for all programs – so anyone can now download the CC 2014 trial versions, install and run them side-by-side with older releases if desired, and then use the new products completely free for 30+ days. As before, the CC software generally can be installed and activated on up to two computers (including both Windows and Mac operating systems at once), and easily moved around between systems as required. Finally, it’s little-known, but all paid CC subscribers also have full access to use previous releases as well when necessary, including CS6 and CC 2013… These older versions are kept available in an online archive for all members to download and install if/when ever needed. We are a bank out of Iowa and would like to upgrade to the latest CS6 programs from our current CS4. We would not like to use the creative cloud because a lot of our designs and information we need to keep confidential. We would basically like to have the software straight on our computers without any connection to the cloud. Do you have an option where we can upgrade without the Creative Cloud and without a Monthly Subscription? Hi Joe, it sounds like you may be under a frequent misconception… Adobe’s new CC 2014 release (aka the Creative Cloud) does not require you to store anything online if you don’t want to. The programs do not run over the web, and usage of the “cloud” storage is completely optional. You can run the tools you love completely on your desktop and store and keep everything locally. 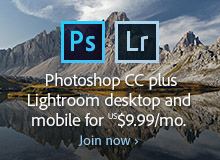 That said, Adobe does continue to also offer & sell CS6 direct (with perpetual licensing), if that’s what you prefer. So you can still upgrade from CS4 to CS6 the traditional way, if you want that instead. However, be aware that Creative Suite 6 is already a bit dated (it came out in spring 2012) and Adobe has no plans to update or upgrade it any further (there is no CS7) – and eventually CS6 will be unsupported by the company. The thing to keep in mind is that for any given Adobe creative tool like Photoshop, InDesign, Illustrator, etc., the CC 2014 version is almost 3 years newer now than the CS6 version, and all together has added over 1,000 new features and improvements over CS6. Finally, for a small group of employees such as yours who want to collaborate and work together, you might take a look at Adobe’s Creative Cloud for Teams solution. Hope that helps answer all your questions, if not then just post back!